I recently began a suit project with Joe Morgan, one of the most supremely talented cutters on the Row. Joe is both technically exacting and stylistically innovative. Not only does he make best use of the Tommy Nutter inheritance, updating those big lapels and nipped waist for a modern audience, but he continues to come up with new designs. Descending the stairs to the basement of 12 Savile Row will always reveal some new model, often inspired by one of the highly creative apprentices and tailors he works with, such as Michael Browne. My suit will be a navy three-piece, cut in a heavy twill from Dugdales with high-waisted trousers and a one-button jacket. We will incorporate many of the Nutters of Savile Row style points, but also some modern twists, such as lapped seams on the trousers. All grounded in that honest Huddersfield cloth. 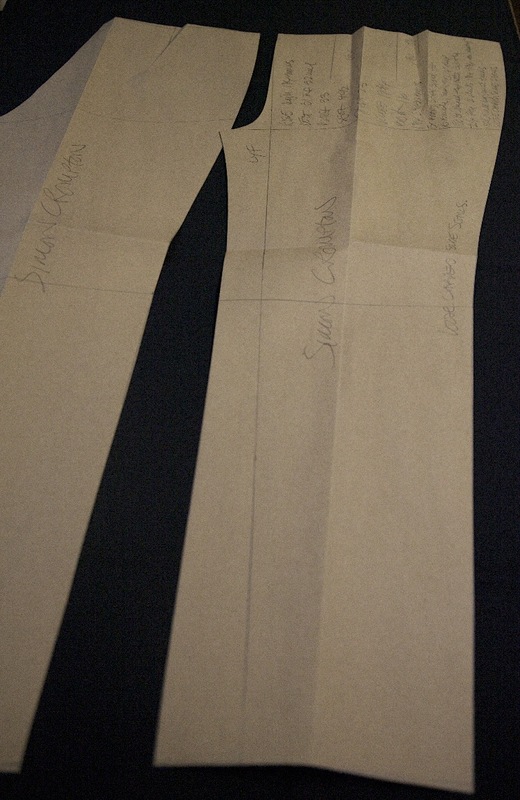 As a precursor to the series, I include a few shots here of the trouser pattern Joe has made for me. It demonstrates a few of the technical points that translate into that particularly sharp cut that Joe is known for. The first point to highlight is the left-hand side of the pattern above, which translates to the inside seam of the trouser. The fact that the gap between it and the pencil line is smaller at the top than the bottom shows that Joe cuts a relatively closed trouser, that is to hang perfectly when a man has his legs slightly closer together. Joe believes most tailors cut a trouser that is too open. 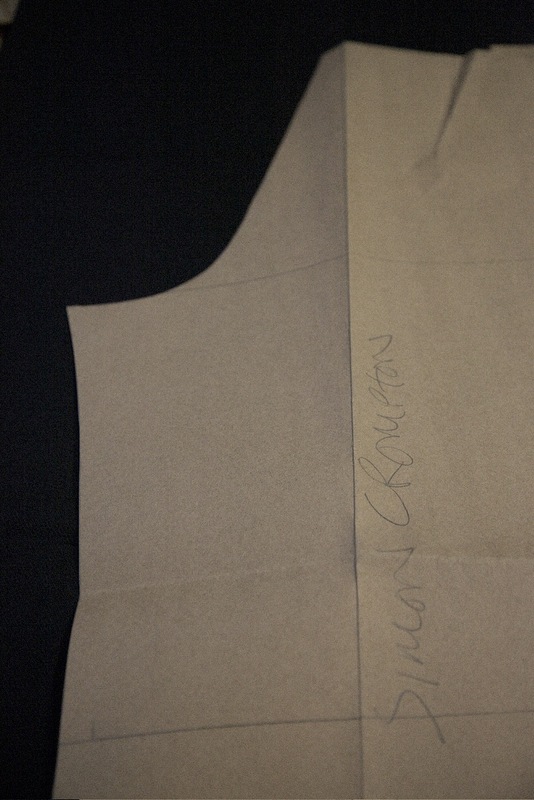 Second, the curve at the top of the other part of the trouser pattern shows what is called a ‘crooked seat’ – the angle required to get up and over my bum, and into the small of my back. Again, Joe thinks not enough tailors put that amount of slope into the pattern. And the third point is a construction one. 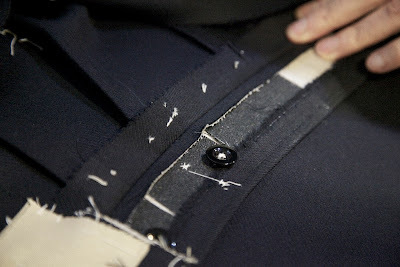 Joe does many things to shape the suit, relying less on the tailor to do so. The darting in the chest canvas, for example, is quite extreme, and in the image at the top of this post you can see how the waistband lining on the trousers is slit to allow it to curve. There are plenty of others, such as making the top sleeve a lot bigger than the bottom sleeve, so the seam rotates inside the arm and can’t be seen from the front. But there’ll be plenty of time for those over the course of the series. You can follow the discussion on Chittleborough & Morgan suit: Part one by entering your email address in the box below. You will then receive an email every time a new comment is added. These will also contain a link to a page where you can stop the alerts, and remove all of your related data from the site. Very much looking forward to this. I’m fond of the Nutter cut. What has made you change to high-waisted trousers? A desire to simply experiment, or a more significant change in your personal style? Interesting reading in perspective, very nice choice of tailor. Glad to see you trying these guys out, I’m a huge fan of the fellows from Nutters. I look forward to seeing the results. Theo, I agree with the Nutter link. I collect my first commission from Steed in a couple of weeks. Edwin was both with A&S and Nutter, and I am really looking forward to it! simon are you able to advise on approx costs for C&M jackets / suits? Better than that, I can give exact costs! Two-piece suit is £3000 plus VAT, so £3600. Very good value. From the trouser pattern it looks like they will have pleats. Is this just an experiment? I would always have at least one pleat on high-waisted trousers. Did you mean $4600? $3600 would be unbelievably well priced for a tailor of this quality, as crazy as that sounds. Sorry, that should have been pounds, not dollars (I’ll change it now). Still good value though, as I say. C&M have just started their blog, not as indepth as this so far but still fun if you want to follow one tailor. Indeed. Luke’s photography and/or camera have been doing well! did you continue with this post? Simon,I like the trousers.Kindly post pics of the trousers (front,back an sideways)when its finish.The line drapes down gracefully.Among the best looking trousers i’ve seen lately.